Thanks to Acerola’s help, Ash arrives at the Ruins of Abundance, home of the Ula’ula Island Guardian Tapu Bulu. Ash wants to train with Tapu Bulu to prepare for his rematch against the Island Kahuna Nanu, and after our hero demonstrates his friendship with his Pokémon, Tapu Bulu springs into action! 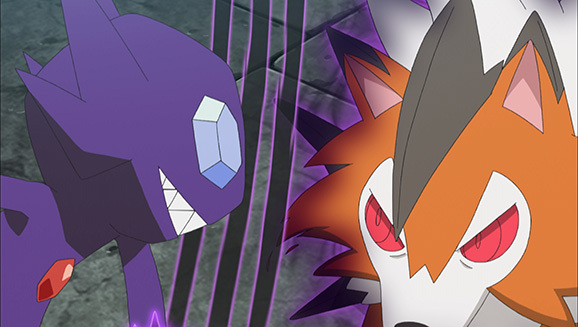 Showing immense power, the Island Guardian engages Ash and Lycanroc in battle—and Lycanroc learns how to use Stone Edge! As the bond between Ash and Lycanroc grows, Tapu Bulu returns to its nap, satisfied that the training session was a success! Ash is determined to train with Tapu Bulu, and Tapu Bulu is determined to be as unpredictable as ever!